Sober Look: Air France's tragedy is a gain for Boeing. Let's hope for a miracle. Air France's tragedy is a gain for Boeing. Let's hope for a miracle. "Officials said the Airbus A330-200 sent automated messages of electrical failure and pressure loss as it hit turbulence, vanishing from the radar early in its flight from Rio de Janeiro to Charles de Gaulle airport in Paris." But as it often happens in the financial markets a competitor is rewarded. 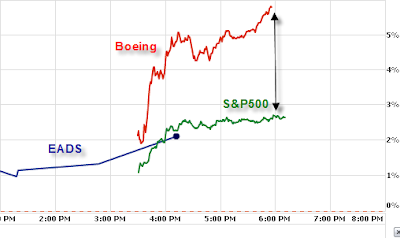 Boeing rallied by over 5%. It's unclear whether this will hurd EADS (manufacturer of Airbus) - it will depend on the reasons for the failure. The shares have been stable (though did not rally with CAC which is up 3%). French and Brazilian teams are out there searching. Let's hope for a miracle for the 228 people aboard.